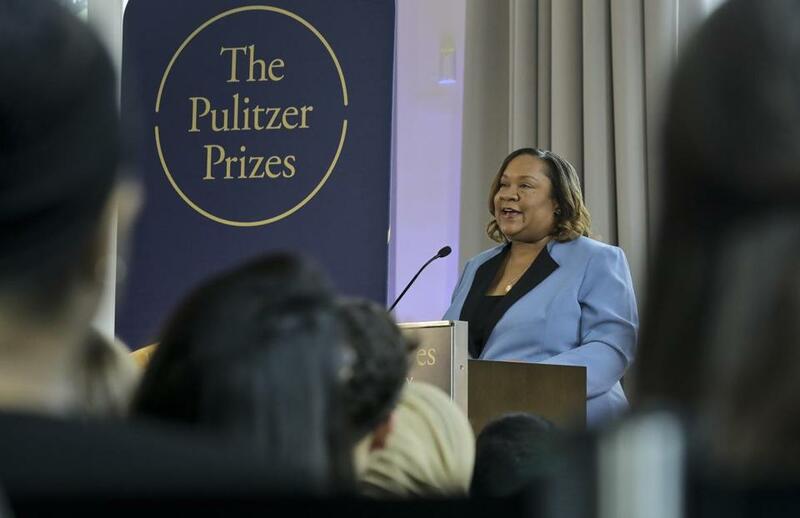 Dana Canedy announced the 2019 Pulitzer Prize winners Monday in New York. Before Pulitzer Administrator Dana Canedy got to the winners, she announced she was going to “break with tradition” by shouting out a submission that didn’t win: the obituatries of the 17 students and staff members killed in the February 2018 shooting at Marjory Stoneman Douglas High School published by the school’s student newspaper, The Eagle Eye. The South Florida Sun Sentinel won the prize in public service for its reporting on the missteps of school and law enforcement officials before and during the Parkland shooting. The Pulitzer in breaking news reporting was awarded to the Pittsburgh Post-Gazette for its coverage of the massacre at Pittsburgh’s Tree of Life Synagogue that left 11 dead. The Globe’s Craig F. Walker was also a finalist for the Pulitzer in feature photography for his work on “Raising Connor,” a story that chronicled the life of Connor Biscan, a 13-year-old Hopkinton boy with autism and mental health conditions. Amanda Kaufman can be reached at amanda.kaufman@globe.com.